Inzwischen hat Sheri weitere Informationen über Keith Havens von seiner Frau Marian durch deren Pfleger erhalten. Hier die Antworten auf Sheri’s Fragen: I found the game of JATI stored here and also talked with Marian about the game and your questions. Keith was born in Robbinsdale in 1921. Marian doesn’t know if he signed any games, but since he was an artist then he probably took the opportunity to sign whatever he could. The second signature looks more like his usual one. She didn’t sign anything for him that had to do with his games and art work, so the first one is his also (she couldn’t really see it so the comparison is mine). She said his writing was very neat. The directions in the game that I found also list the name of JATI as DRAGON or KARACHI. This game has black plastic with square pegs and colored cubes. 3M thought it was too noisy so they requested burlap to make it a quieter playing game. Marian said that he didn’t have a goatee on very long and usually was clean shaven or had a mustache. In my opinion that photo doesn’t look like him a lot but since I only knew him in his later years I’m not an expert about his looks as his family is. There still is interest in his games. Her daughter and grandson also know a lot more about the games than Marian can remember. „Botch“ was a favorite one they liked to play. 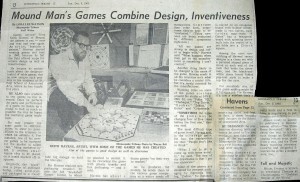 There are still a lot of games around here in storage as they said he had a hard time marketing them in later years. 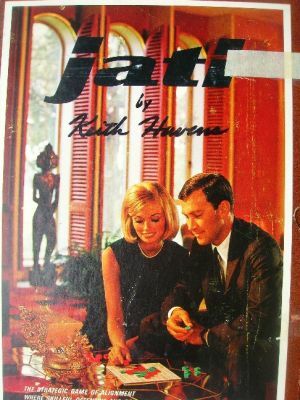 Lange Zeit war nicht bekannt wer der Autor des gesuchten Sammelobjekt „Jati“ von 3M war, doch dann fand Sheri McNally bei einem Garagen-Flohmarkt ein Jati (ESG#40), das auf dem Titelbild die Aufschrift „by Keith Havens“ trägt. Außerdem befand sich in dem Spiel noch ein Zeitungsausschnitt aus der MINNEAPOLIS TRIBUNE vom 05. Dezember 1965 mit einem Artikel über den Spieledesigner Keith Havens. Diese Information gab Brian Skafica am 08.04.2008 über die „3M Games Yahoo! Group“ an die 3M-Sammler weiter. Zeitgleich fanden die beiden „Westpark Gamer“ Günther Rosenbaum und Aaron Haag bei ihrer Suche nach Informationen zu Keith Havens ein Referenzschreiben aus dem Jahr 1999, das die Originalunterschrift von Keith Havens trägt (siehe unten). Der Vergleich der Unterschrift mit den Signaturen auf den beiden Jati zeigt eindeutig, es handelt sich um die Handschrift von Keith Havens. Somit wird die Frage „Wieviele Jatis hat Keith Havens handsigniert?“ wohl nie beantwortet werden. 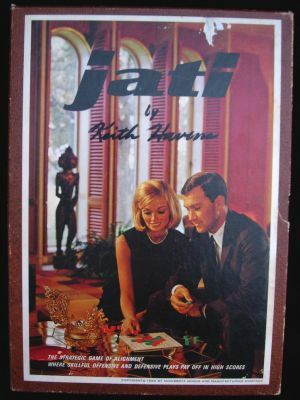 Until April 2008 nobody knew about the author of the rare Jati game. Then Sheri McNally found at a garage-sale a copy of this collectors item. This Jati (ESG#40) is signed „by Keith Havens“ on the front side. Inside the game box she found an article from the MINNEAPOLIS TRIBUNE dated 5th December 1965. 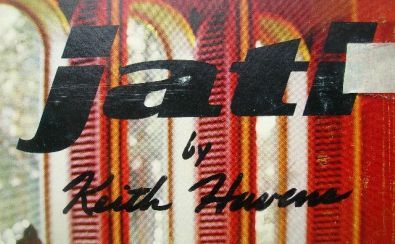 This shows that Keith Havens is the designer of Jati. This information was communicated by Brian Skafica on April 8th, 2008 via his „3M Games Yahoo! Group“ to the 3M-collectors. Searching the pictures archive of the ESG-homepage Jürgen Schick found a second Jati (ESG#3) in the collection of Ingo Laubvogel with a similar signature. Comparing the two clearly yielded: The signature is not printed, it has been written by hand. At the same time the two „Westpark Gamers“ Günther Rosenbaum and Aaron Haag found a document from 1999 that was signed by Keith Havens. 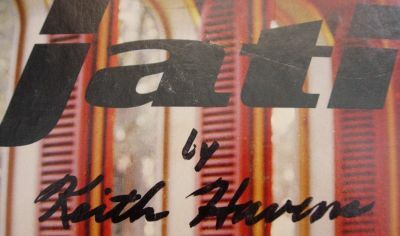 Comparing this original signature with the two handwritten signatures on the game boxes one can easily see: These signatures have been written by Keith Havens himself. In the meantime Sheri McNally found an address in Grand Marais , Minnesota that was the official home of Keith Havens. 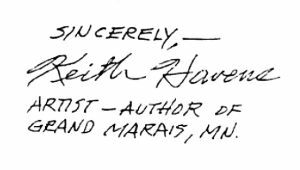 She wrote a letter and on 13 April 2008 got an answer: Keith Havens died in August 2006. So the question „How many Jati games did Keith Havens sign?“ may never be answered. Thanks to: Sheri McNally, Brian Skafica with his „3M Games Yahoo! Group„, Ingo Laubvogel, Aaron Haag (westpark gamers) and Günther Rosenbaum.